The last time we updated you on our long-term CRF250L, we told you about the front suspension upgrade. We also have a rear Race Tech G3-S shock for the bike that was provided by series sponsor CRF’s Only, but didn’t want to fit that at the same time in order to isolate the front and rear upgrades during testing. 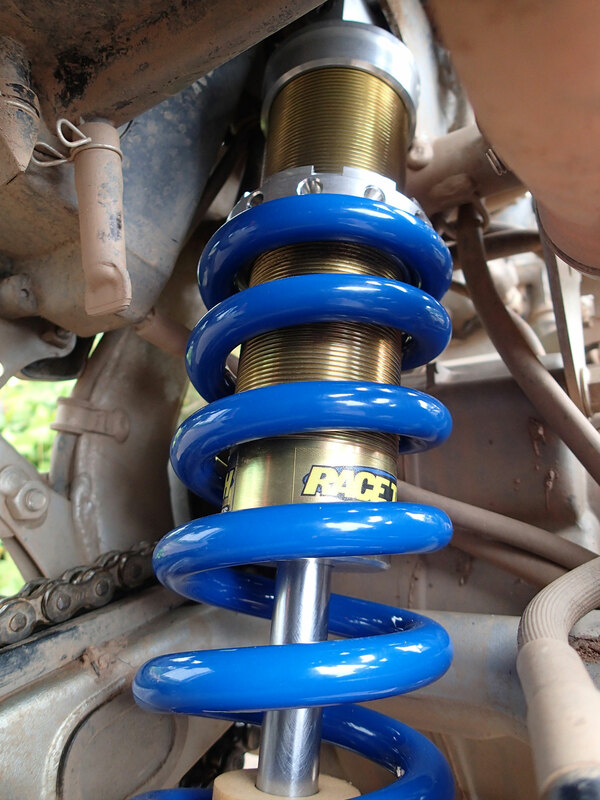 All G3-S shocks are custom built to order and includes Race Tech’s Gold Valves and Hi-Performance Lightweight Springs selected for the individual rider’s size, type of riding and ability – we ended up with something in between my own and ‘Arris’ requirements. Installation was remarkably simple. You need to support the rear as once you remove the original shock, there’s nothing holding it up, but the CMG milk crate did an excellent job. Then it’s off with the top bolt and the lower rocker assembly and out she comes. The Racetech then slipped into place and the bits bolted back on – way simpler than the front upgrade mods! Race Tech shock was very easy to install and bought the backend up to the level of the front. So, with the shock installed, we hit the trails on one of the season’s last FAR scouting missions. 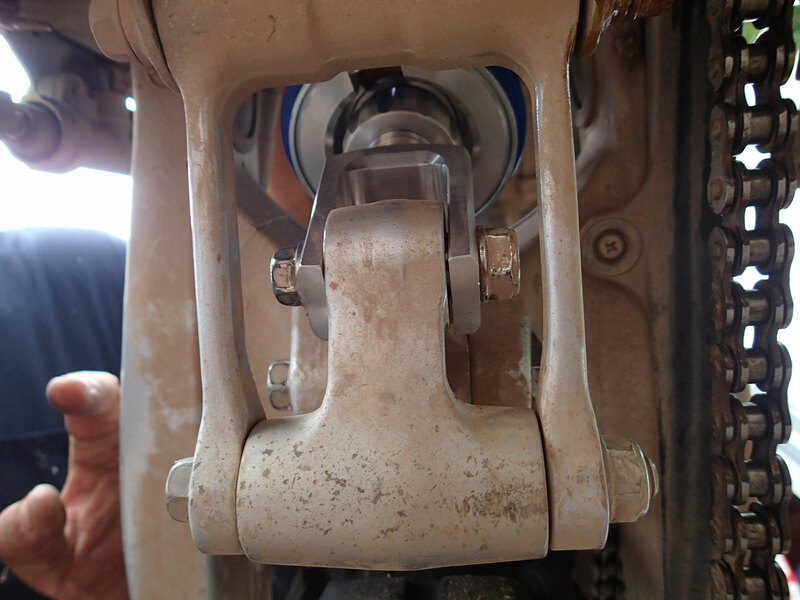 And here’s the thing about bolt-on suspension upgrades: It’s hard to say much about them, except whether they work well or not, or if they need some fine-tuning after installation. And the RaceTech shock upgrade works very well, without any need for fine-tuning. When we put the RaceTech springs and valve kit in the front, the front wheel tracked very well, and had great control off-road. But, the downside of only upgrading the front end meant the stock shock’s shortcomings became more evident. The front tire stayed planted, but the rear tire would break loose in the bumpy stuff. With the RaceTech shock installed, there were no such problems. I had the opportunity to travel on several different types of terrain throughout the day, ranging from bumpy backroad pavement, rutted trails, mud bog, loose gravel, and even beaver ponds, and felt the rear end was much more stable. Handling is transformed from typical budget dual-sport bouncing, to controlled precision. The bike puts full horsepower to the ground instead of spinning. On a small-capacity bike like the Little Red Pig, that’s even more important. Instead of adding extra ponies, you’re using all the power available, which is an even better upgrade. Slightly wider bottom fork on the Race Tech shock didn’t leave much thread on the lower bolt for the nut. Thread lock will hold it altogether though the shock should ideally come with a longer bolt. There is one downside to the shock, however. In stock form, the CRF250L is a fairly comfortable ride on the street, thanks to its cushy rear shock. The upgraded Race Tech unit is not as comfortable due to its taughter ride. ‘Arris did miss some of the cushy nature of the original setup on faster trails as the new setup transferred more of the bumps to the rider, though the overall tighter setup was still significantly better off-road than the competent but soft original set up. Still, you cannot argue with the improved tracking, response and the resulting ability to ride faster as a result. Yes, it’s a considerable investment at over US$700, but if you are starting to find that the stock suspension is becoming the limiting factor in your off-road riding, the Race Tech shock and front suspension kit will take the CRF’s suspension up to a more professional level. Sweet little bike. Can’t wait for the 300cc version.